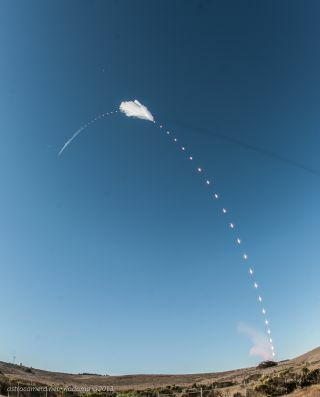 Kodama used a Nikon D700 camera with a Sigma 15 mm fisheye lens shot at 3-second intervals, Kodama captured the unmanned, next-generation rocket's trajectory as it launched from the SpaceX launch pad at Vandenberg at 12 p.m. EDT (1600 GMT) on Sept. 29. "For me, it was also the first rocket launch where I was close enough to hear the rocket," Kodama wrote on his website astrocamera.net. The photographer was 3 miles from the SpaceX launch pad when he took the series of images that were later combined to create this photo. "The white cloud is probably a vapor trail caused by passing through a layer of humid air, and the dark line running off to the right is a shadow cast by the cloud." Also visible in the image, if one extrapolates the rising part of the trajectory, is a faint crescent moon. SpaceX's new Falcon 9 rocket features many upgrades over the private spaceflight company's original Falcon 9 booster. Its nine first stage rocket engines are an improved design and are arranged in a circular pattern (called the "Octaweb") instead of a three-by-three grid. They can generate 50 percent more thrust in a vacuum than the earlier Falcon 9 design. SpaceX also hopes to experiment with rocket reusability using the first stage of the new Falcon 9 rocket. To see more amazing night sky photos submitted by SPACE.com readers, visit our astrophotography archive.